Foreign currency hedging refers to applying a strategy to reduce the risk derived from the high unpredictability of foreign currencies. Exchange rates change easily and are very volatile. Such changes can lead to heavy losses if between the time of transaction and time of payment or receipt adverse changes of the exchange rates occur. In order to eliminate or at least minimize the currency risk, foreign currency hedging is applied. Foreign currency heading refers to a strategy that aims to reduce the risk of foreign exchange transactions. Two opposite, offsetting positions are involved in this strategy, taken in two different, but parallel markets. The positions are taken in such a way, that in the end the result of each offsets the other. For example, if there is an excess profit registered in one market, it is counter balanced in the other market by a loss. The final result is actually what the trader initially expected. This way, expenditures and incomes are not really affected by major changes in the exchange or interest rates. To explain further: let’s consider a trader who is long on some currency. His downside exposure will be protected by a short position in some other market, perfectly offsetting the first one. This is what hedging is. Here are some hedging strategies used for foreign currencies. Lagging and Leading Expenditures and Income: A trader can choose to pay in advance, which is called “lead” or to pay late, which is called “lag” the payments in foreign currencies, depending on the changes in the exchange rates he expects to take place. The depreciation of the foreign currency, which, on the other end, means that the home currency has appreciated, means that the trader would have to make higher payments or get lower receipts. Netting Payments and Receipts: Netting refers to clubbing or matching the payments and the receipts in a particular currency, so that in case of losses in receipts, they can be compensated by gains in payments or the other way around. A firm has many other internal strategies to hedge the foreign currency operations, but the most used ones are the ones mentioned above. However, more traders prefer the external strategies when it comes to hedging foreign currency due to the broader scope these external strategies offer. Internal strategies can hedge only a limited amount of risk for foreign currency, unlike the external hedging strategies for foreign currency. The most popular external foreign currency hedging strategy is the forward contracts. Such contracts lock in the exchange rate at a fixed value for both payments and receipts. The rate in the forward contracts is the one determined by the market. Forward contracts offer stability to payments and receipts, so both payer and receiver know the exact amount that they need to receive or pay. 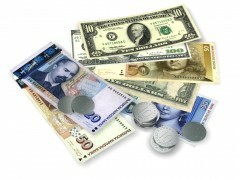 The exchange rate established at the transaction time is of small importance. This is a good protection against losses, but it also means that extra profits can’t be made as they could have been in case the exchange rate at the time of the transaction had been better than the one established in the contract. Futures trading is an equivalent of the forward contracts strategy which is used in commodity markets. Currency Swaps mean that exchange transactions happen in real time without delays or lapses in time period. Things are immediately exchanged one for another. In the case of currency transactions, the currency swap means that payments and principal of a contract with interest that is fixed in a certain currency will be swapped with the principal and payments of a loan of equal value, but in a different currency. Although it may sound complicated, it is actually very easy. This means that one swaps the fixed payment obligations in a currency with somebody else who has fixed payment obligations in another currency. The result is that both parties can deal in a currency they trust more, so the risk of foreign currency is reduced between the two participants.